NEW YORK (CNNMoney.com) -- Shares of Toyota Motor jumped more than 1% after a report suggested that some of the company's recall woes may have been due to driver error. 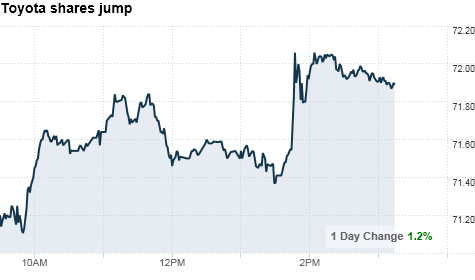 Toyota was up 83 cents, or 1.1%, to $71.89 a share in afternoon trading. Shares rose to a high of $72.14 shortly after the report was published. The U.S. Transportation department has been analyzing data from recorders on Toyota vehicles involved in accidents blamed on sudden acceleration. According to a report in the Wall Street Journal, the analysis has found that throttles were wide open and the brakes were not engaged at the time the cars crashed. The results, if correct, suggest that some drivers who said their Toyota and Lexus vehicles surged out of control were mistakenly holding down the gas pedal when they intended to hit the brakes, according to the Journal. However, the report adds that the findings would not exonerate Toyota from two known issues blamed for sudden acceleration in its vehicles: sticky accelerator pedals and floor mats that can trap accelerator pedals to the floor. Toyota recalled millions of vehicles world wide earlier this year for these and other problems. The company has also been criticized by Congress for a sluggish response when the defects were identified. Toyota (TM) spokesman Brian Lyons said the Department of Transportation has not provided any information on the analysis to the company. He added that Toyota's own investigation has found a number of causes for unintended acceleration. "Our findings have determined a number of explanations or causes, including pedal entrapment by floor mats or other objects, sticking pedals, pedal misapplication, engine idle up, or no trouble found," he said. The Department of Transportation declined to comment on the report.